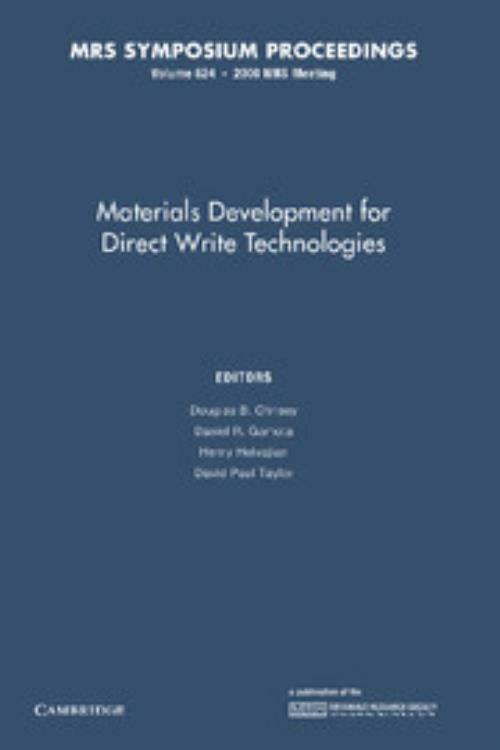 The goal of this book is to identify and develop new materials approaches based on the direct-write technique (transfer method) and to demonstrate the required electronic or other device performances (chem/bio sensors, phosphor display, FET, etc.). Many different CAD/CAM approaches exist to direct write or transfer material patterns and each technique has its own merits and shortcomings. Many approaches are presented including plasma spray, laser particle guidance, MAPLE DW, laser CVD, micropen, inkjet, e-beam, focused ion beam, and several novel liquid or droplet microdispensing approaches. One common theme to all techniques, however, is their dependence on high-quality starting materials. In most cases, individual direct-write techniques make trade-offs between particle bonding chemistries that are amenable with the transfer process and direct-write properties such as resolution or speed. Optimized materials result in deposition of finer features, minimal process variation and lower prototyping and production costs, higher yields, greater manufacturing flexibility and reduced capital investments. Topics include: relevance of direct-write processing; powder-or droplet-based direct-write processing; laser direct-write techniques and processing; printing methods and consideration for direct-write processing.